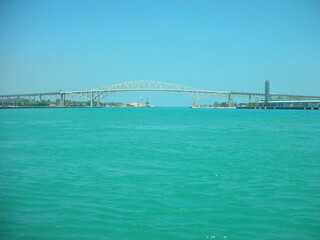 With another scorching summer on hand, we often take refuge with a drive along Michigan’s beautiful blue waters. 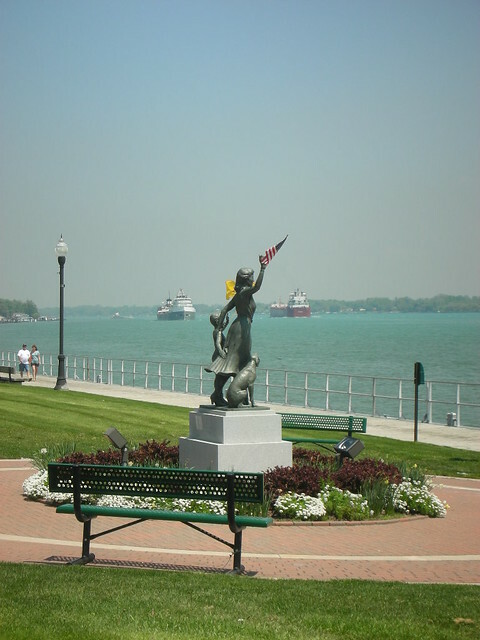 One of our favorite routes is to follow the shoreline from Lake St Clair to Port Huron via M-29; the turquoise blue water and lake breeze does wonders for both mind and body. 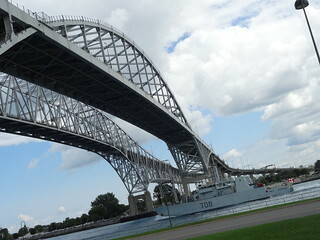 In Port Huron the double span of the Blue Water bridge is picturesque as it crosses the St Clair river; the water turns a cobalt blue as it flows into Lake Huron, Canada awaits on the other side. 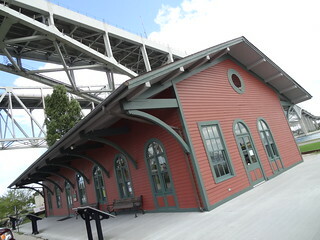 We parked at the Thomas Edison Depot Museum located on Edison Parkway; in front of us the Thomas Edison River Walk stretches south from under the bridge to the USCG dock; a favorite spot for sight-seers, walkers and fishermen, it is always a bevy of activity. Today we were in search of a little history and some air conditioning; inside the museum we go! Built in 1858 for Grand Trunk Railroad the tiny Fort Gratiot Depot is now home to the Thomas Edison Depot Museum. As you can clearly see, young Thomas made a great impression on the city during his boyhood years. 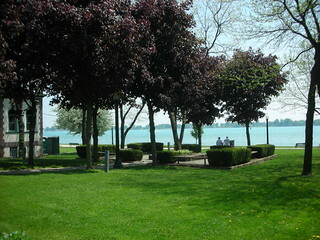 The Edison family moved to the area from Ohio, that’s where his story begins. I think it’s cool that this is the actual structure where Thomas worked as a “news butcher”; beginning in 1859 the then 12-year old boy departed daily from this depot on the Port Huron to Detroit run. The young entrepreneur actually published the first newspaper to ever be printed on a moving train, the Grand Trunk Herald; his job was to sell newspapers and candy to train passengers, he was quite successful. 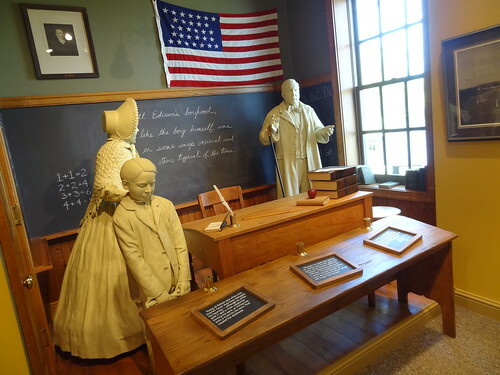 There is not a lot of square footage for exhibits, but all look fresh, are done well and give visitors an opportunity to participate hands-on. 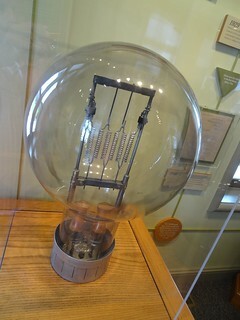 The timeline continues into Edison’s adulthood and success as an inventor. A restored baggage car is just outside the museum, you are able to go inside and have a look at what Thomas’s printing shop and mobile chemistry lab would have looked like. 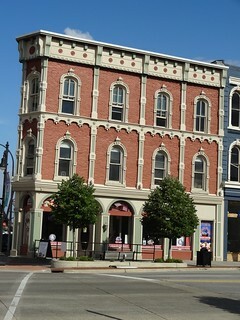 The museum is really interesting, be sure and stop in. 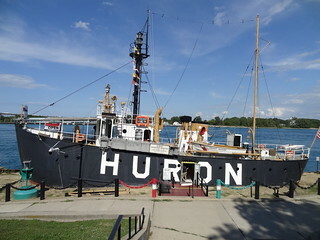 We continued our drive south on the parkway to Pine Grove Park where the Huron Lightship Museum is embanked; definitely check this out! Built in 1920 she was launched simply as Lightship 103 of the United States Lighthouse Service. Back in the day, floating lighthouses were used in places where it was too deep or too costly to build an actual lighthouse. 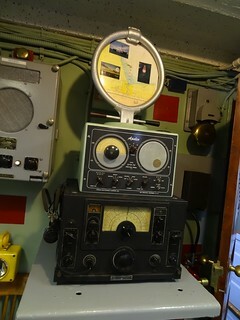 A light shone brightly at the top of a mast, ships also sounded fog signals when visibility was difficult. 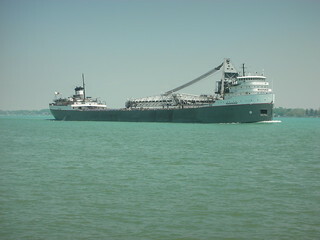 This was the last lightship afloat on the great lakes; it was retired from active service in 1970, enshrined at Grove Park in 1972 and in 1989 the Huron was designated a National Historic Landmark. It is an amazing opportunity to be able to climb aboard such a neat piece of history. 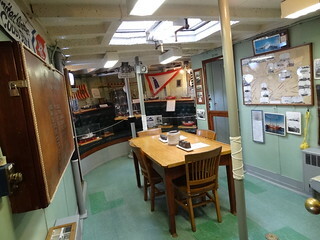 We first wandered around the main level and got an idea of what it was like for the crew to live aboard; the galley is long and narrow, complete with stainless steel sinks and counters, a small dining area consists of a simple table and chairs, cots dangle from chains in the sleeping area…..not exactly roomy. We climbed down the ladder into the engine room; originally powered by a compound steam engine, in 1949 it was converted to diesel power using 2, 6 cyl. GM 6-71 engines. Get an up-close look at the gauges, tanks and over-sized components that made this ship run; hard hats and lanterns hang overhead; I can only imagine how loud it must have been down here. Back up the ladder, a turn, then up another stairway to the weather deck; here you get a complete panoramic view of the dazzling river, bridges and deep blue lake, Wow! 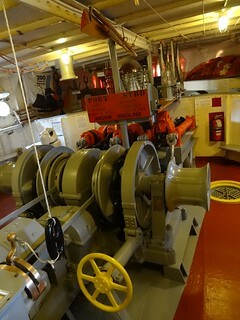 Here you also have access to the pilot house, complete with its signature brass steering wheel and numerous gadgets. When we completed our tour it was time for lunch, we drove a little further south to the banks of the Black River to find some outdoor dining. This area of downtown in particular seems to be thriving with new life; every time we come there seems to be a new restaurant or cafe. 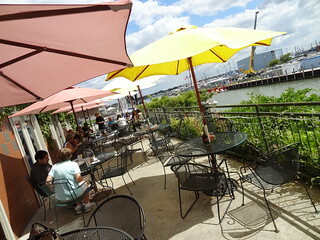 Quay Street Brewing Co. offers both indoor and outdoor dining on two levels with fantastic water views; we chose outdoor. There was a table available right along the river’s edge; we were on the upper deck, mounds of Wisteria vines hang off the side and create a roof over the patio level. 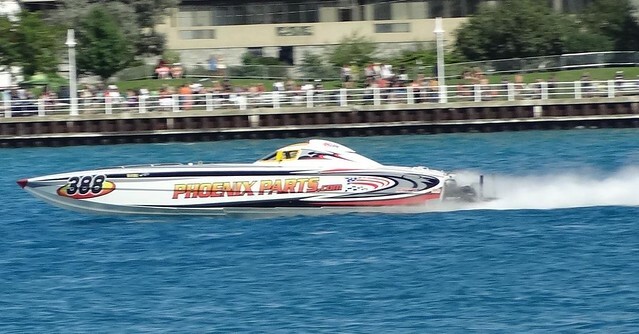 As we started to look at the menu our attention was diverted by the rumbling sounds that can only be made by a powerboat; sure enough we had stumbled upon the 2nd Annual International Offshore Powerboat Races at Port Huron/Sarnia. That’s the advantage of living on the great lakes, it seems no matter where you go or what lake you are near you can always find yourself smack dab in the middle of some great event. Kris inspected the boats more closely as they traveled by on the Black River, going to and from Lake Huron, I studied the menu. First order of business at a brewery; choose a beer. 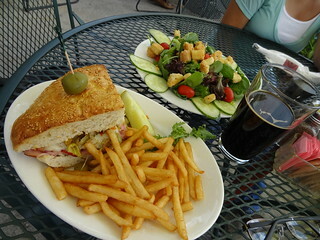 I am very fond of dark beers, so it was an easy choice with the Black River Stout. 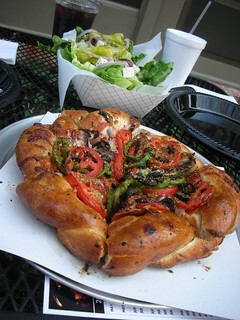 Food was more difficult because everything looked good. We settled on the Muffuletta sandwich; a wonderful diced olive mixture topping a stack of salami, mortadella, capicollo and provolone on a roll. The Garden Salad was large; crunchy romaine and veggies with a unique lemon-mint vinaigrette, delicious and refreshing. We sat at our table under the shade of a bright yellow umbrella; the food was tasty, the beer, excellent and the boat race an unexpected pleasure. Yes, it’s good to live in Michigan! A few local folks told us about a new ice cream shop in town, so we went over to have a look. 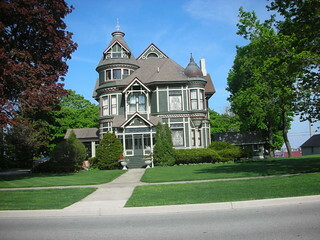 I know I’ve said it before, but, Port Huron has a gorgeous downtown, the lovely Victorian style of a by-gone era still remains here. 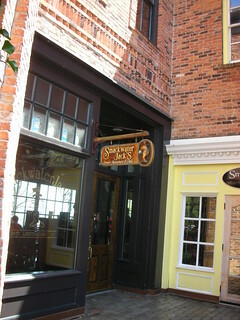 The Mackinac Island Creamery on Water St is located in one such building; beautiful red brick and fanciful trim painted in shades of green, looking as pretty as it did when it was new. Inside we discover its former life as a bank; along the back wall a safe serves as a reminder; incredibly fancy it even has a landscape painting as part of its decor. 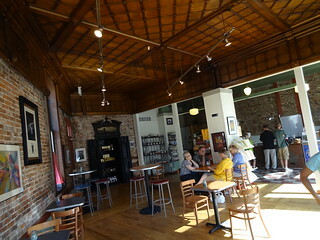 The ceiling is unusually stunning; an intricate wood design that carries down a cove. 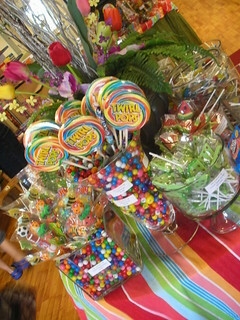 The shop serves, as you may have guessed, Mackinac Island Creamery brand of ice cream in 12 delicious flavors, they also sell Mackinac Island Trading Co. fudge and POHO popcorn. The flavors all sounded good, there is a different feature ice cream each month, the flavor for August was a creamy vanilla ice cream with rich cinnamon swirls throughout, like eating a decadent cinnamon roll, yum! 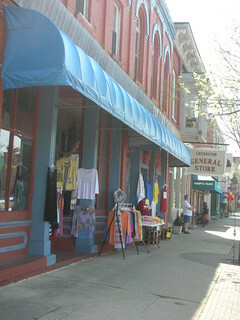 The shop was busy with customers; a family stood by the map of the US placing a pin near their hometown in Pennsylvania. 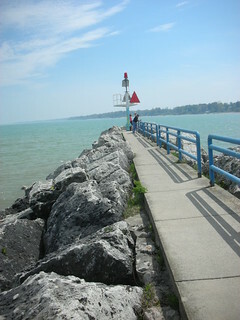 It’s good to see people discovering Port Huron and our beautiful Blue Water Area!